Torys is very proud to have received the Thanks a $Million award for our 10 years of support of Bikes for Tykes, a fundraising event for Bloorview Kids Foundation, which supports children with disabilities. 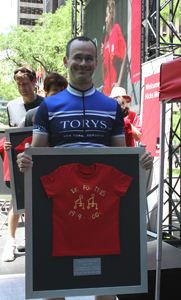 Now in its tenth year, Bikes for Tykes has raised over C$1 million through one-day spinning events held in the heart of Bay Street. This year, more than 400 individuals participated in the event at the TD Centre courtyard across from Torys' Toronto office.